Sometimes when I think of Jesper all I can see is his dark back on the way across the white sea to Hirsholmene. It gets smaller and smaller and I stand at the end of the ice feeling empty. Why didn’t he ask me to go with him? I have a will of my own, but if he had asked I wouldn’t have hesitated. I always went with him. After all, I had to look after him and he had to look after me, and my father would have been furious with us both. Staying there alone was meaningless. In To Siberia, the 60-year-old “Sistermine” looks back over her early life and young adulthood, sharing memories as they occur to her. She tells of her early job delivering milk, of a few friends and family members, of the Nazi occupation of her town, and of the jobs and lovers she takes on in her early adulthood. We know little about her present-day life, and some of the details of her earlier life remain sketchy. We do know that as a child she was strong, independent, intelligent, and curious about the world but that the circumstances of her life were almost unceasingly bleak. I walk forward and put the books on the floor beside the mattress and he does not wake up, just breathes evenly so I can feel it on my face. I stay there standing over him, a long time perhaps, and cannot make myself straighten up. My back will not obey, it hurts from my neck down and heat spreads in my hips, and then I start to cry. I cry as quietly as I can, for I am afraid he will get tears on his face, afraid he will wake up and see me looking at him and my chest hurts when I cry and hold it in at the same time . . . I fill my head with thoughts till it feels purple and hot like the glowing iron at the blacksmith’s forge while I stand bent over my naked brother weeping because he is beautiful as pictures I have seen in books of men from other times, grown men, and if I could remember why I came out to find him, it would not mean anything now. He is not the same anymore, cannot be and his am around my shoulder will never be the same again. The narrative itself is generally chronological, but it meanders around in place and time. As I’ve mentioned before, I often don’t like this kind of stream-of-consciousness style, but here it works because the narration operates as memories do. You can understand why the telling of one story would lead Sistermine to recall a much earlier incident. Some readers might become impatient with the fact that Sistermine doesn’t always share what seem like important facts about what is happening and why. For me, it wasn’t a major problem because once I got used to the fact that this book is a book of memories, not a story, I could accept the fuzziness of the narrative. Sistermine’s tale is really a tour of the bleak emotional landscape of her life, with occasional bursts of ephemeral joy. It probably won’t make it onto my list of favorites for the year, but I’m glad I read it. 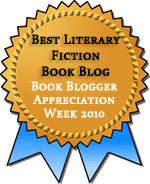 See another review at Reading Matters. This was also too fuzzy for me to completely appreciate. I liked it but not enough to be a personal favourite. Claire: I did like this, but I found myself having to go back and reread a lot to see if I missed some important plot point–sometimes I had and sometimes I hadn’t. And another novel by Petterson, I Curse the River of Time, will be released in English in August 2010. I’m really looking forward to that. Sandra: Thanks for the link! 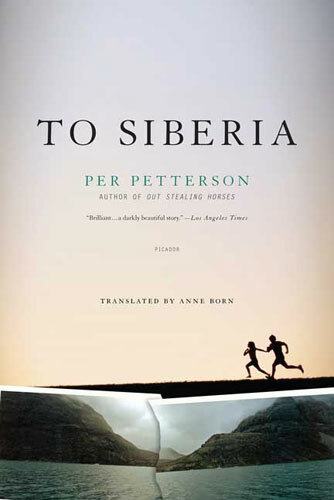 I am interested in reading more Petterson at some point, and I’ve heard good things about Out Stealing Horses. Given the things you mention enjoying in this review, I agree with Sandra that you will likely enjoy Out Stealing Horses – if you remember when I read it a few months back, although I found the story itself rather slow and quiet, I was captivated by the writing because of how evocative of a time and place that it was. There was a stillness and a weight to the prose that really added an additional sensory element to my reading experience. In the end, although OSH wasn’t a favorite for me, I felt similar to you – glad I read it, and I’d be up for reading more Petterson in the future (though don’t feel any hurry to do so). Steph: Petterson’s writing is beautiful! I very nearly made my review nothing but quotes because the story itself was almost incidental. (I’m having a banner week on good, but bleak, writing because I was also listening to Yates up until yesterday.) I’ll go take a look at your review now. Ive had one of his books on my shelf for quite some time and haven’t picked it up yet. I kind of hope it is this one. I love the fuzzy memory story-telling shtick. Lena: If it is this one (or even if it isn’t), I hope you enjoy it. The whole memory fuzziness angle, FWIW, isn’t so much about reliability in this case as it is about the randomness and free association involved in how we looks back. The book really does read like memories. For ages I’ve been meaning to read Out Stealing Horses. I liked your review of this novel very much, and really must get around to picking up Petterson’s work. Litlove: I’ll be curious to see what you think of Out Stealing Horses. From what Steph said in her review, I get the impression that it’s very similar in style to this one. I may read it one of these days, but like Steph, I’m in no great hurry. I’ll have to be in just the right mood, I think. Petterson has also been in the back of my mind as someone to read at some point, and Out Stealing Horses is the title I’ve heard most about. His style sounds like one I would enjoy, as I like the kind of interior focus you describe here. Dorothy: I think this book was just released in the U.S. late last year, so it hasn’t gotten much attention, but I suspect you’ll be hearing more about it in the coming months, given the popularity of Out Stealing Horses. Oh I saw this book at the library and have been wanting to read it. I’m not sure why I think Siberia is such an interesting place to me. Thanks for the review! So glad you liked this. He is one of my favourite authors. Am excited to hear that Sandra says there’s a new one in the offing this year. I’ll be the first in the queue to get it! Kimbofo: I did enjoy this, perhaps not enough to consider Petterson a new favorite author, but enough to consider reading more. And you weren’t kidding about how that ending packs a wallop.